Taking Exit 65 off the AP7 Motorway (Benidorm Levante) the main road will lead you to the centre of Benidorm. Our recently refurbished Double rooms are decorated in a modern contemporary style with your comfort very much in mind. All rooms have a balcony with furniture. Comfortable double or twin beds and a flat screen TV offering a selection of national and international channels, together with a telephone and desk area. The bathroom is well equipped with a full bathroom comprising of bath with shower, hairdryer and a full complementary toiletry selection. Our recently refurbished Double Rooms with Club Service are decorated in a modern contemporary style, with your comfort very much in mind. All rooms have a balcony with furniture. The room allocation is subject to availability. Also included in our Club Service are the following extra services: Fridge (mini bar) with welcome drinks, tea / coffee making facilities, bottle of wine, pool towel (per person with a 20€ refundable deposit), Club amenities (daily replenishment of amenities), safety deposit box, bathrobe and slippers. 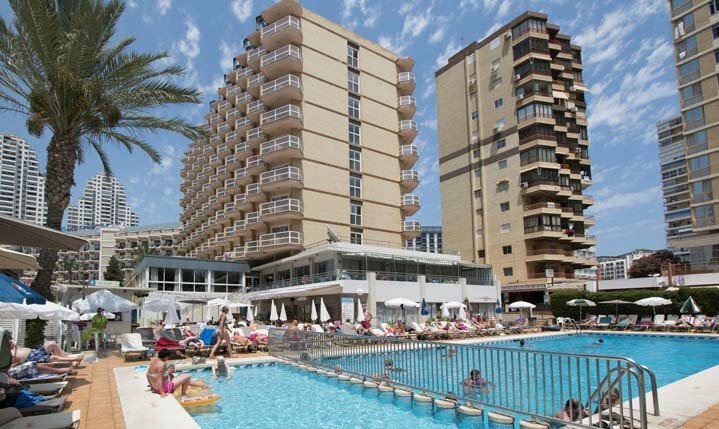 The Hotel Riudor is located in a well-connected central area of Benidorm, and only 150 meters from the Levante beach. It has a three star category and many years of experience in providing a professional service to our clients. The rooms are all equipped with a full bathroom, balcony, TV and air conditioning. There is a buffet-style restaurant which boasts a wide variety of dishes from both Mediterranean and Continental cuisines. In the evening our guests can enjoy live performances by British singers as well as dancing in the bar-lounge. At the Hotel Riudor you will enjoy a holiday full of activity and you can return home with a fond memory of this Mediterranean tourist enclave: Benidorm, a modern city of sun, beach and leisure. The hotel Riudor is exclusively for adults. Guests under the age of 18 years are not admitted. The clean, golden sand beaches of Benidorm, the warm climate, the horizon and the wide avenues all create a fantastic destination for spending a relaxed or active holiday, whether you’re looking for an active night life or a relaxing time at the beach. Our entertainment team organizes daytime activities such as petanque, ping pong, billiards, darts during the summer. At night enjoy musical performances, comedy, quizzes, karaoke. Our dining room service is buffet-style with a wide variety of Mediterranean and continental dishes to choose from. • The hotel does not have parking. • 350 m. away: public underground parking garage. • Highly experienced professional staff. • In central area of Benidorm. • 100 m. from the Levante beach. • 350 m. from public parking garage. • Meal times vary according to season. Normally: breakfast (8am to 10:15am); lunch (1pm to 3pm); dinner (6:30pm to 9pm). • Main bar (9am to 1am). • Pool-side bar. Open in summer(11am to 5pm).